A warm overcast day. We took the Sprinter from Driebergen to Utrecht, then another train to Rotterdam. This trip takes you through an area that is more than 7 metres below sea level. Everyone was going to Rotterdam. According to Kees, Rotterdam is where they make money and Amsterdam is where they spend it. We walked along the main street called ﻿﻿Coolsingel and found quite a few cool things. One was a shop called Studio Hergebruik or Re-use Studio, in which all the merchandise was groovy stuff made from recycled materials. The constant passing parade of people on bikes of all shapes and sizes was interesting too. 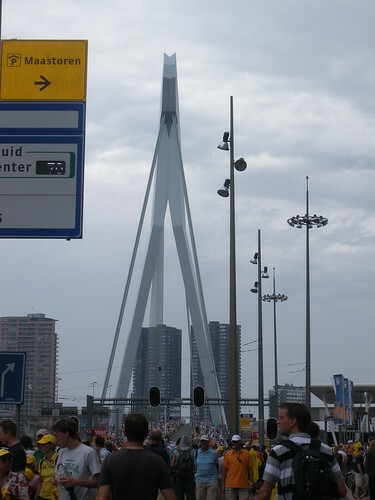 As we came closer to the Erasmus Bridge we joined the massive crowd that had arrived to watch the Tour de France prologue. It began to rain and all TdF merchandise vans were immediately swamped by people buying yellow umbrellas and plastic ponchos. Thanks to Ian’s foresight we were equipped with raincoats. We found a reasonable vantage point where the riders passed in both directions. When Stuart O’Grady was on his way we appealed to the people in front to allow us to squeeze in so that Ian could yell and I could film. 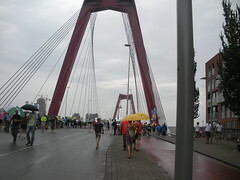 This done we walked around the course, across the Willem’s bridge where we could see the famous cube house. We also heard the results of the World Cup game – Germany 4, Argentina 0. The Dutch do not want to play against Germany in the finals! But maybe they will have to. There are less than 6 hours of darkness here at the moment – from about 11pm to 4.30am – so it’s easy to stay up late without realising. We have heard that the Dutch Parliament is trying to form a coalition between 4 or so parties because the major parties are not major any more. This entry was posted on 4 July 2010 at 7:07 pm and is filed under Netherlands. You can follow any responses to this entry through the RSS 2.0 feed. You can leave a response, or trackback from your own site.